For those riders who don’t wish to get their hands dirty or don’t have the time we do bike repairs and maintenance. We take the ‘not-for-profit’ and ‘community’ aspects of Nottingham Bikeworks very seriously, but we still have to pay the rent, buy milk and biscuits and stock up on parts so charges do apply. If you’d like us to repair your bike, drop it to our workshop and we’ll do our best to get it good as new and back to you ASAP. 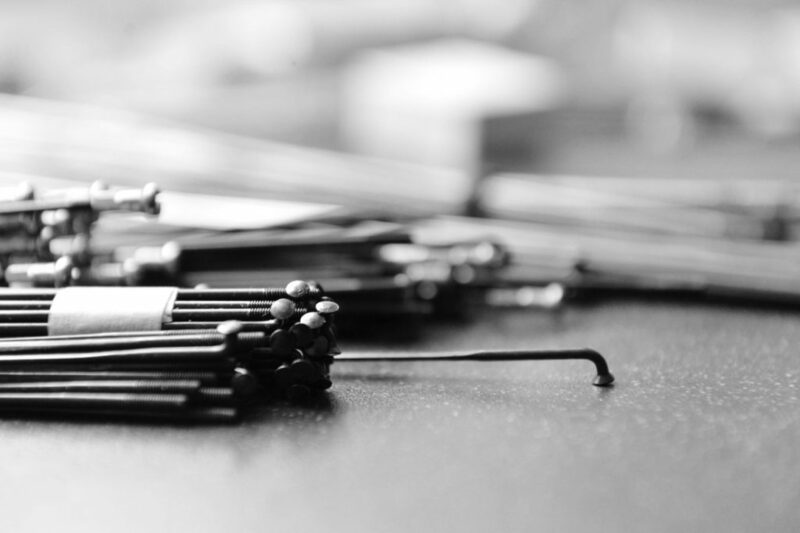 If you’re unsure what work your bike needs we’re always glad to take a look and give you a free, no obligation estimate. 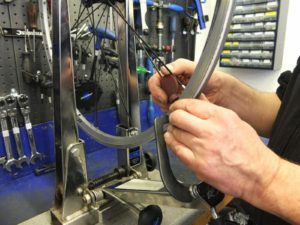 Nottingham Bikeworks is happy to carry out all servicing and repair work on your bike, from a gear tune-up to a full strip-down and overhaul. Our mechanics are all experienced, friendly and fully qualified with a minimum of City and Guilds Level 2 and/or Cytech Level 2. We mind about our customers and want you to come back to us again and again. We take pride in delivering consistently high standards of work and will never overcharge you for unnecessary and expensive work. And if there is a problem with our service just talk to us and we’ll do all we can to set things right. Think of this a bit like giving your bike a quick health MOT. Just the ticket if your bike’s been stuck in the shed for months, or if you’ve bought a second hand bike you’re not sure about or simply for peace of mind. Our fully qualified mechanics will systematically check your bike over including frame, brakes, gears and tyres. 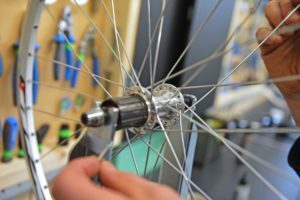 If we think your bike deserves or needs a bit more work then we’ll present you with a detailed checklist so that you can decide what to do next. If you do decide to go ahead with a standard or deluxe service with us we’ll not charge you a penny for the safety check-up. Prices do not include parts and fitting of these will also incur extra labour charges except cables and brake blocks as above. – This is the full Monty, the whole hog, with nothing left to chance. – We’ll strip your bike right down to its component parts, clean every bit using our environmentally-friendly ‘SmartWasher’. Then we’ll put the whole thing lovingly back together again, road test it and hand it back to you in a pristine condition. 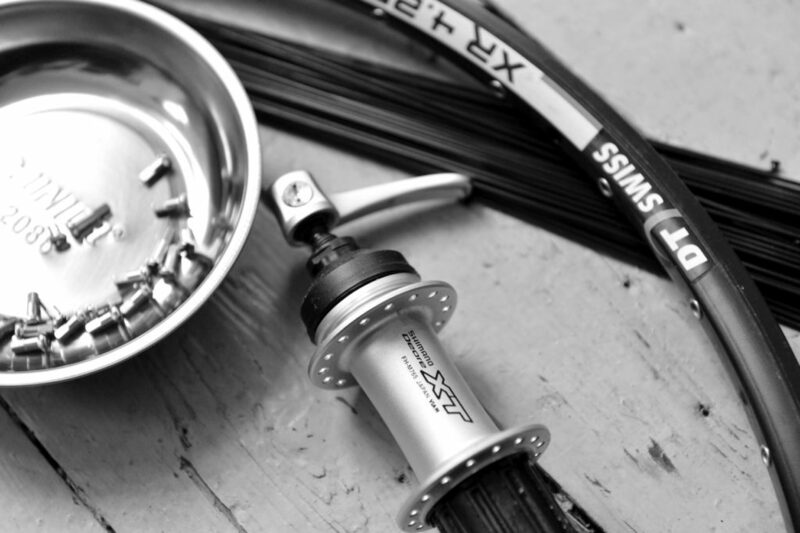 – All serviceable bearings (headset/ hubs/ bottom bracket) will be fully serviced and re-greased. – Prices do not include parts but there is no extra labour charge for fitting with the exception of hydraulic brakes/ suspension. – Spoke replacement plus truing – £15.00 front; £20 rear. – Fitting new inner tube and/or tyre including punctures – £5.00 (additional £5 for hub gears and drum brakes.